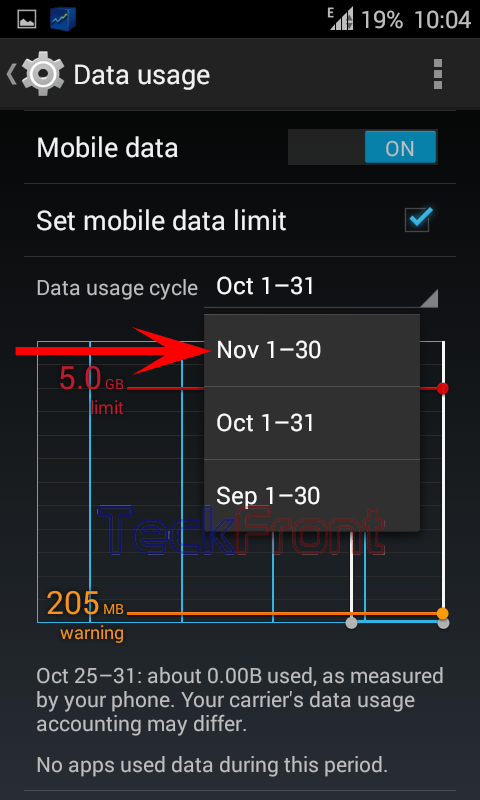 How to Plan Mobile Data Usage Period on Android 4.4.4 KitKat Device? Planning to control the Internet data usage bill depends upon the wise planning of the period setting in which to limit the data usage and then setting the usage limits. The key to control Internet usage bill is the wise usage of the Internet data in the specified period. The setting of period plays the most important role in the Internet bill control. You may set the limit during that period in which Internet usage is expected to excel the limit. There are many types of periods which can be set to limit the usage of Internet. The selection of the period is the first step in the data usage planning. You may set the data usage period by following the instructions. Command Line: Settings – Home > Data Usage – WIRELESS & NETWORKS. 1: Follow the Command Line to open up the ‘Data usage’ screen. 2: Check if the ‘Mobile data’ usage is set to OFF, tap to switch ON it. 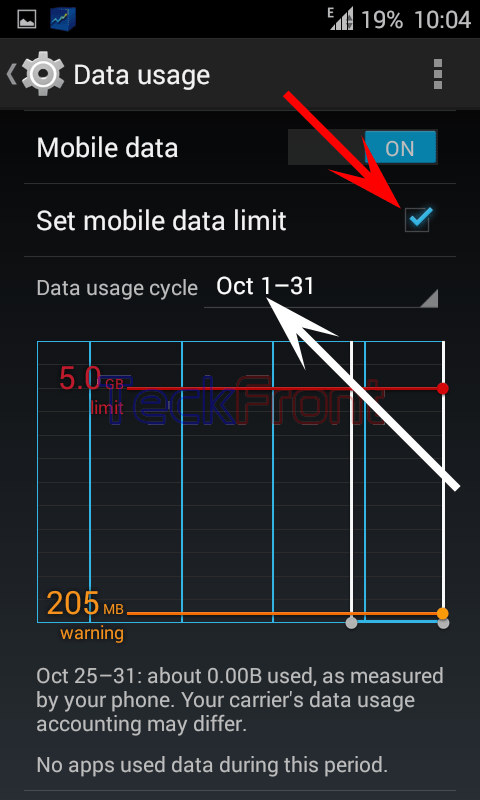 3: Now, check if the ‘Set mobile data limit’ is checked or not, i.e. enabled or disabled. 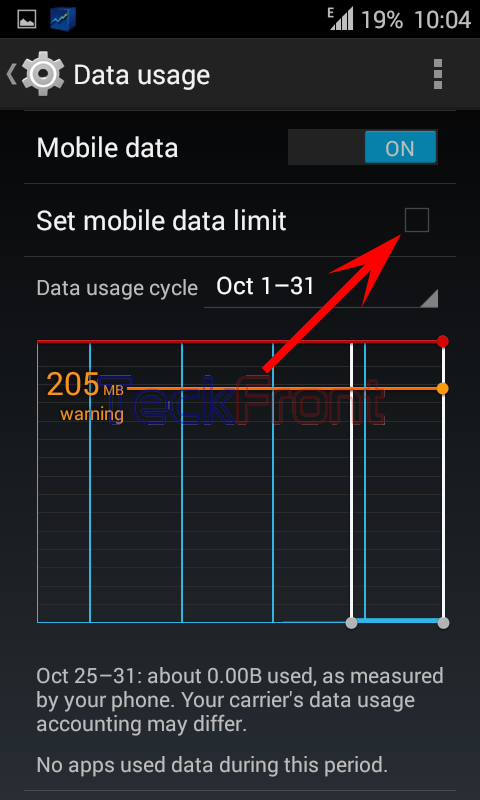 If ‘Set mobile data limit’ is not checked, i.e. disabled, the ‘Data usage cycle’ will also be disabled and will display previous cycle period. 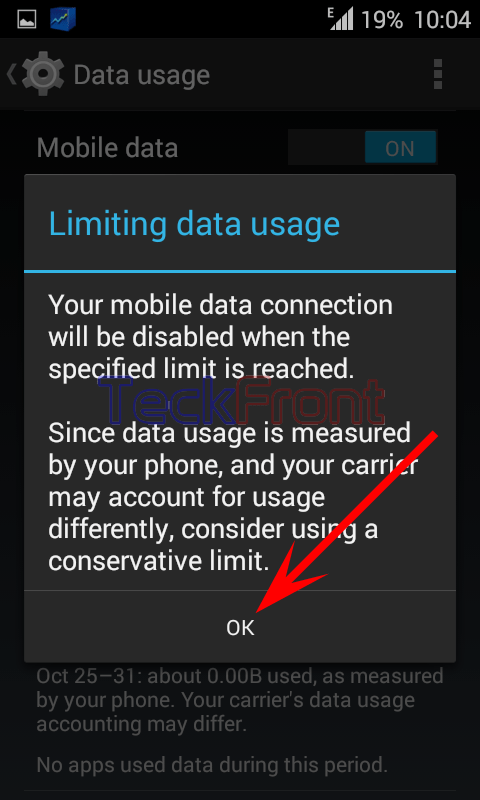 4: If the ‘Set mobile data limit’ is not checked, tap to check it and a prompt will appear to advising you to consider using a conservative limit to avoid the limit which may not tally with that of your internet or phone carrier. 6: Now, see the ‘Set mobile data limit is checked and enabled. ‘Data usage cycle’ is also enabled. 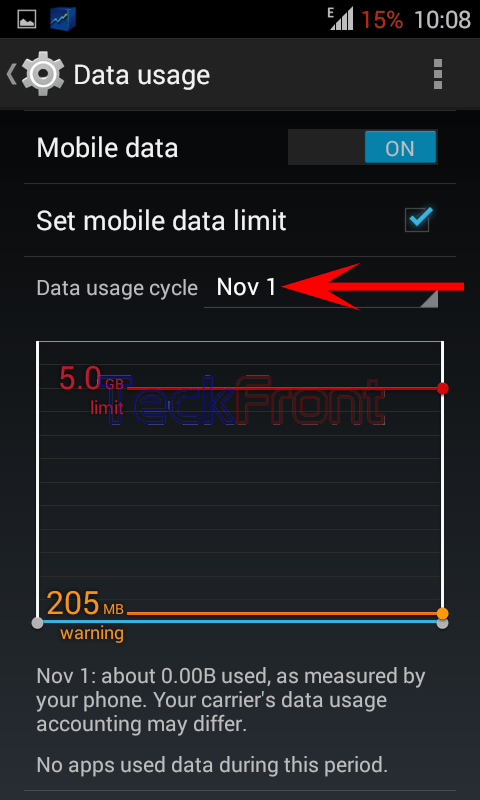 7: Tap the ‘Data usage cycle’ and it will open up a popup menu, displaying some periods. You may select any of the period as per your desire or need. I selected and tapped Nov 1 – 30 and it was selected. 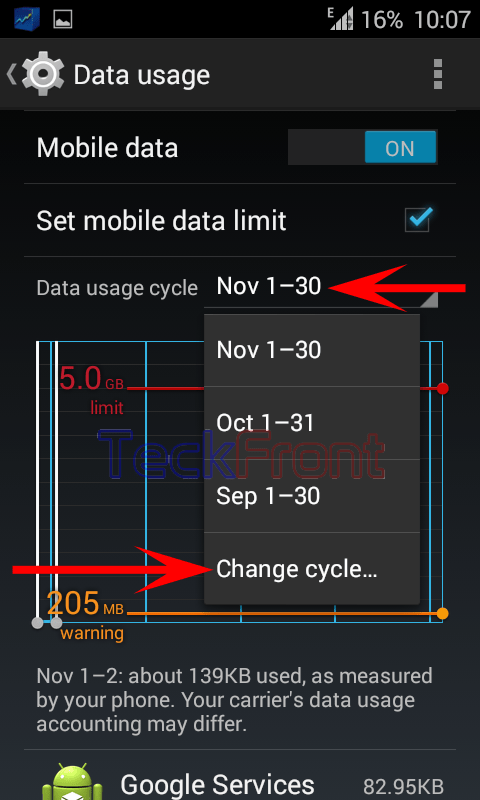 8: To select the mobile data limit as per your specific requirements, tap ‘Change cycle’. It will open up a prompt; ‘Usage cycle reset data’. 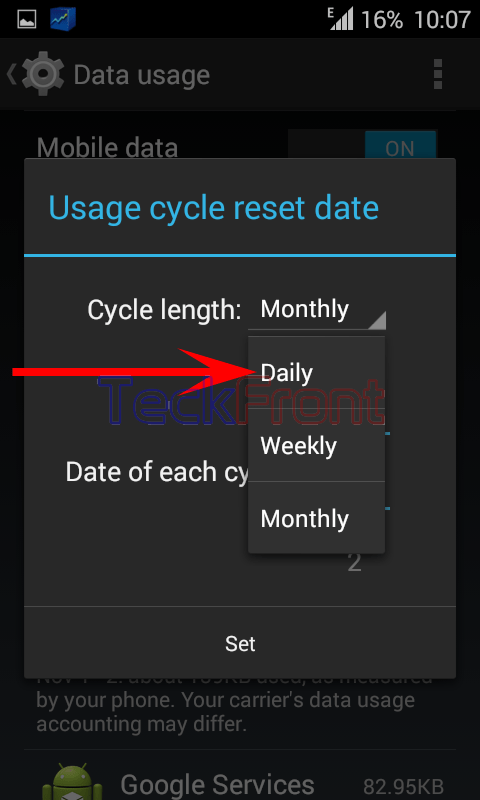 9: In the ‘Usage cycle reset data’ prompt, tap the ‘Cycle length’ and a further prompt will open up, displaying Daily, Weekly and Monthly length. Select the one as per your requirements. I Selected and Tapped ‘Daily’ as test. 10: See the ‘Cycle length’ is set as ‘Daily’. Tap ‘Set’. 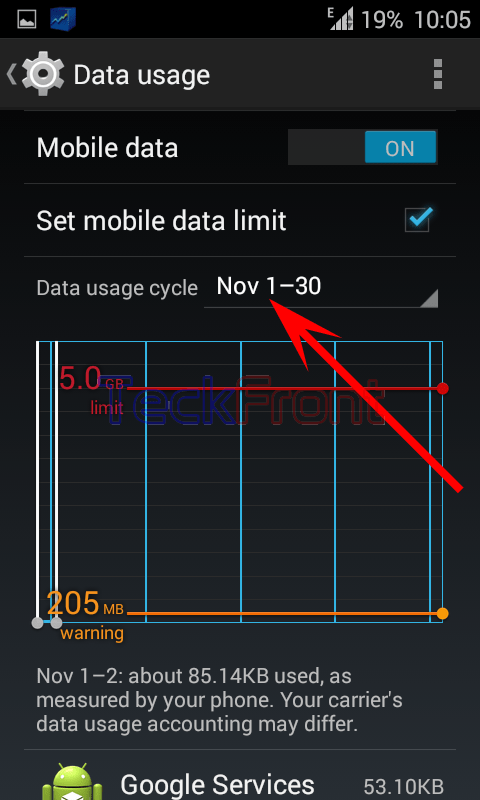 11: See the ‘Data usage cycle’ is set as ‘Nov 1’. Now, you may set the data limit on the daily basis. 12: To change the ‘Data usage cycle’, tap the ‘Data usage cycle’ and tap ‘Change cycle’. It will open up the prompt. 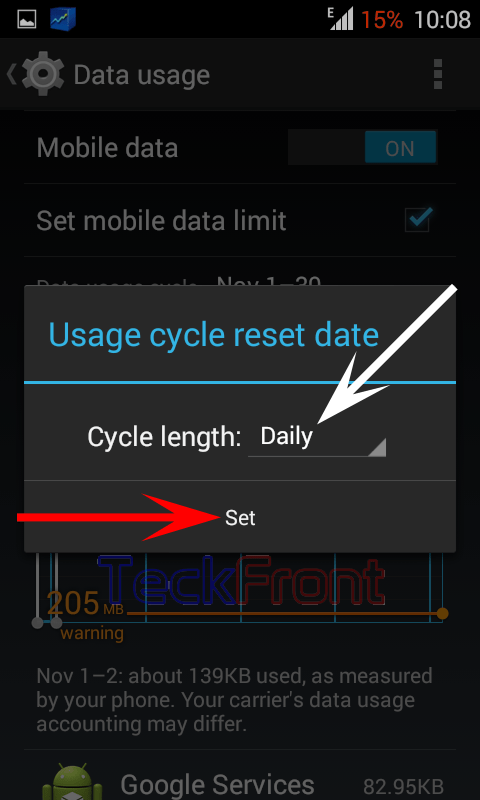 13: From the ‘Usage cycle reset data’ prompt, select and tap the ‘Cycle length’ and ‘Data of each cycle’ by scrolling up or down. I selected ‘Cycle length’ as ‘Monthly’ and ‘Date of each cycle’ as ‘5’. 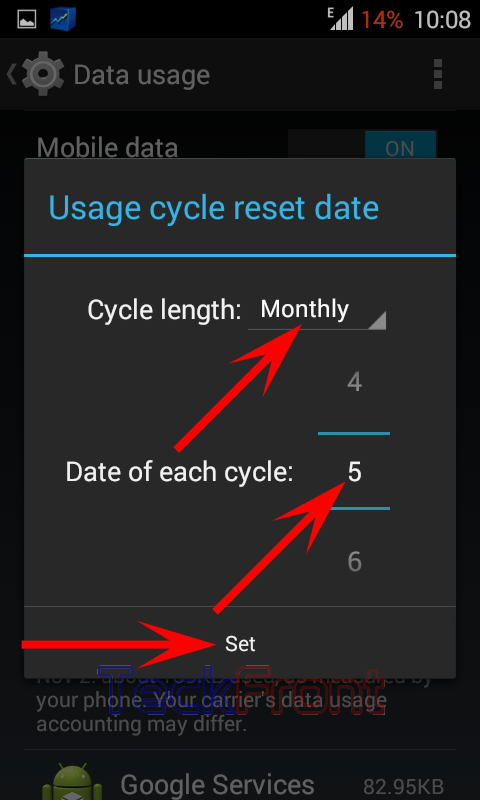 14: Tap ‘Set’ to save the ‘Data usage cycle’ and the new cycle period is displayed, i.e. 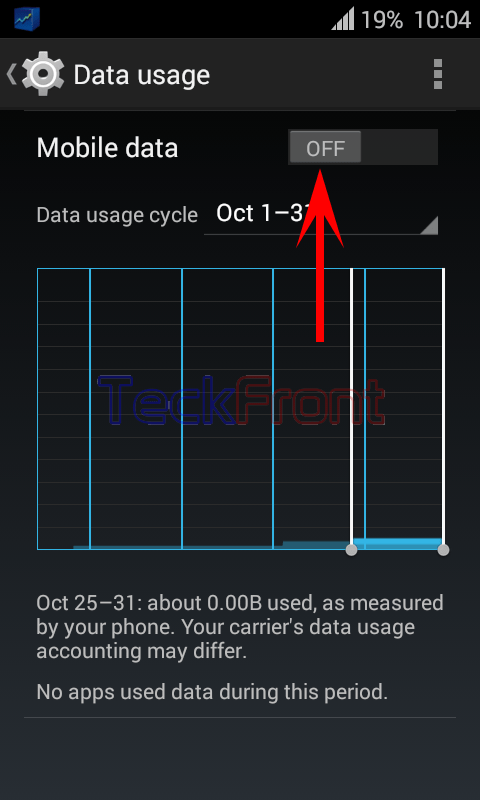 ‘Data usage cycle’ is set as ‘Oct 5 – Nov 4’. 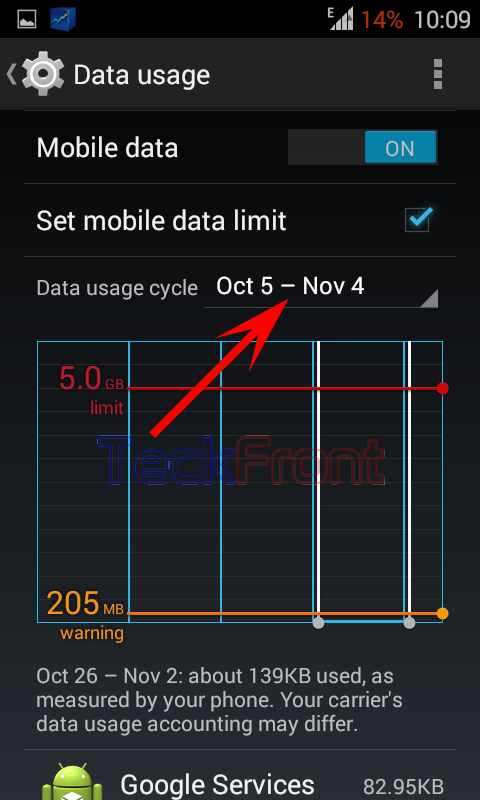 Similarly, you may set the weekly data cycle limit as well. Newer How to Set Data Usage & Warning Limits for Android 4.4.4 KitKat Device?